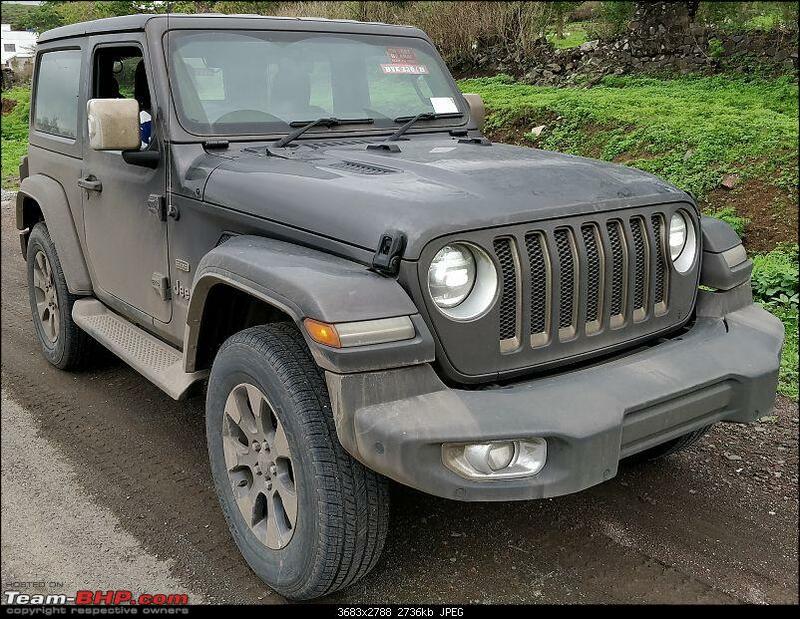 Local testing of the fourth-gen Jeep Wrangler (Jeep JL) commenced in India this year. 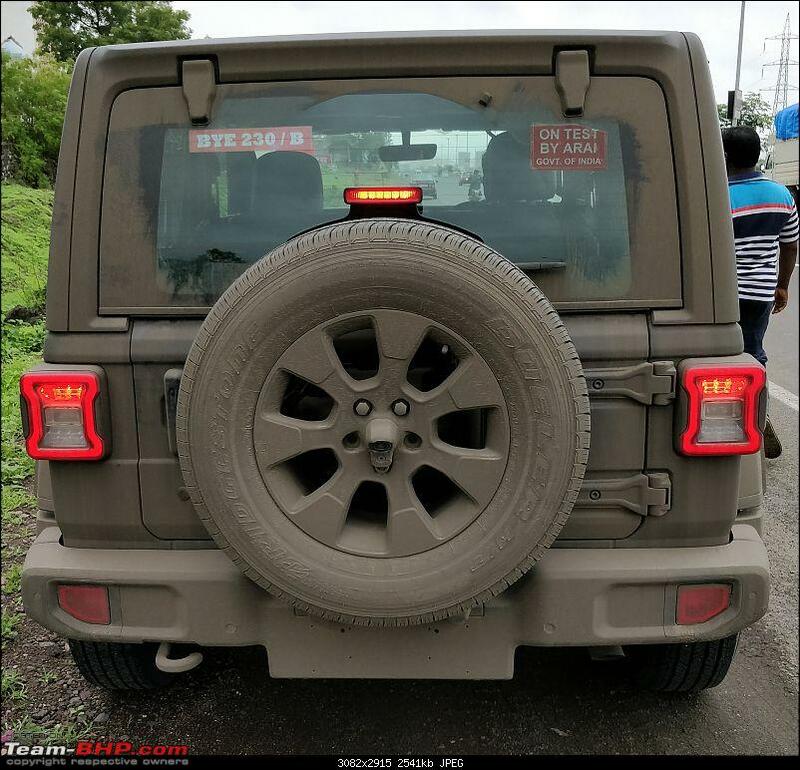 Team-BHP forum member varunswnt has posted spy shots of a 2-door Wrangler JL captured in India while on a test by ARAI. ARAI testing the vehicle could mean that the launch is close now. The fourth-gen Jeep Wrangler (JL) could come in Sahara (with Overland pack) and Rubicon grades in India. The 2-door Jeep Wrangler JL mule wears the Overland badging. It is likely in the Sahara grade and equipped with the export-only Overland pack for a more upscale appearance. In Europe, this option offers body colour grille with Bright accent throats and headlamp bezels, unique 18-inch wheels, body colour hard spare tyre cover, and of course, Overland logo. Dedicated leather interior and LED lights complement the SUV's unique exterior. The 2-door 2019 Jeep Wrangler JL Sahara measures 4,334 mm in length, 1,894 mm in width and 1,839 mm in height. It has a 2,459 mm wheelbase and a 260 mm ground clearance. These specifications apply to the configuration employing a new 2.2-litre MultiJet II turbocharged diesel engine featuring Stop-Start (ESS) technology. This four-cylinder unit produces 200 PS at 3,500 rpm and 450 Nm of torque at 2,000 rpm, and it is mated to an 8-speed automatic transmission. The Command-Trac 4x4 system featuring a part-time, two-speed transfer case with a 2:72:1 low-range gear ratio is standard in the Wrangler JL Sahara diesel. There are two other engine options: 3.6-litre Pentastar V6 naturally aspirated petrol and 2.0-litre turbocharged four-cylinder petrol. The 3.6-litre engine delivers 284 PS at 6,400 rpm and 347 Nm of torque at 4,100 rpm and features ESS. Jeep offers it with a 6-speed manual transmission as standard, but there is an option to specify the 8-speed automatic transmission instead. The 2.0-litre engine is part of the Global Medium Engine architecture family. It develops 272 PS at 5,250 rpm and 400 Nm of torque at 3,000 rpm and features ESS. It is coupled to an 8-speed automatic transmission. The car spotter says that the Rubicon grade is also undergoing road testing in India. This grade provides additional off-road prowess and comes with the Rock-Trac 4x4 system that features a two-speed transfer case with 4.0:1 low-range gear ratio. It comes with the heavy-duty next-gen Dana 44 front and rear axles and Tru-Lok electric front- and rear-axle lockers as well. Another talking point of the Jeep Wrangler JL Rubicon is its electronic sway-bar disconnect, a system that allows drivers to have additional wheel travel. No camouflage on the 2-door version suggests that it's probably here only for tests of the engine powering it. Jeep is expected to retain the Wrangler JL with top-of-the-line equipment, including LED headlamps and tail lamps, 8.4-inch touchscreen infotainment system with navigation, Apple CarPlay and Android Auto, leather upholstered seats, 7-inch LED driver information display, four airbags and more. The 2019 Jeep Wrangler JL could go on sale in India towards in the fourth quarter of 2018 (October-December 2018). As opposed to the current gen, the JL could be locally assembled to arrive at a more competitive price.